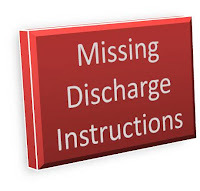 WhereToFindCare.com Blog: Hospital Discharge Instructions: Don't leave the hospital without them! Hospital Discharge Instructions: Don't leave the hospital without them! According to CMS (Center for Medicare and Medicaid), on average, 1 of every 5 CHF (Congestive Heart Failure) patients leave the hospital without discharge instructions every day. This means specific documented instructions for medications, followup care, diet, and exercise restrictions are not being given to hundreds of patients each day. 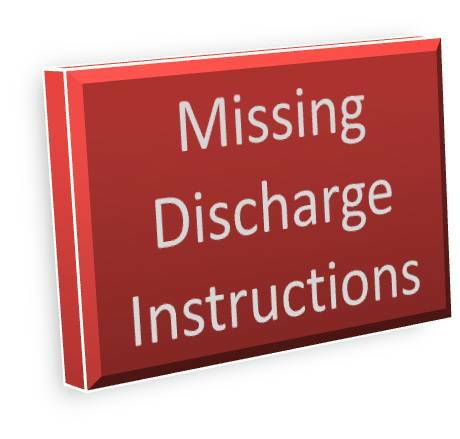 Not following discharge instructions can be a matter of life or death, especially for some patients such as those with CHF, where the readmission rate is almost 25% and the one month mortality rate is 11%. The problem can be fixed. No matter what occasion your visit to the hospital - be sure to request YOUR copy of discharge instructions. Do not leave your room without them. The medical record chart stays on your unit until after discharge so it's easiest to ask before your leave. Leave the hospital without them? Call the nurse unit manager from where you were discharged and ask him/her to overnight you a copy of the discharge instructions so you know your care plan. If they are computerized, they should be able to print a copy and send them to you. Preparing for a hospital stay? Consider taking a discharge guidebook with you. The Agency for Healthcare Research and Quality (AHRQ) has produced a guidebook to assist patients in documenting and understanding what to do after discharge from the hospital. The guidebook is called "Taking Care of Myself: A Guide for When I Leave the Hospital" and is 16 pages long. You can print it out and take it with you to the hospital if a hospital is planned or request it from your discharge planner. Good news is that 428 hospitals across the US give CHF patients their copy of discharge instructions 100% of the time. And another 1300 are between 90% and 99%. Use our hospital finder to see how hospitals perform in your area. You may be surprised.